We’re very excited to have Voxpro join us again for the Jobs Expo. You can meet their team this Saturday from 10am at Clayton Hotel Silver Springs. Register for this FREE recruitment fair today and meet industry leading employers. Voxpro is a business processes outsourcer. The company focuses on delivering beautiful customer service, technical support, trust and safely and sales solutions to clients across the globe. They partner with world’s known game changing companies, unique in their fields! 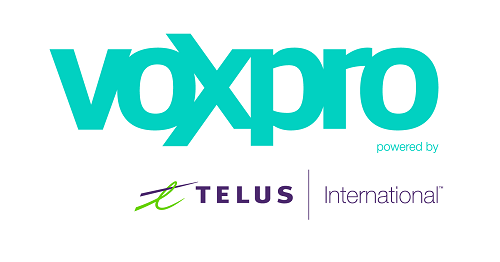 Voxpro is now part of the Canadian Company Telus International, operating in all parts of the world, starting from Eastern Europe to Asia and South America. They’re open 7 days a week, 365 days of the year to support their clients’ customers and as such you may be required to work a variety of shifts but this will be clarified with you on the phone at the initial contact stage and depends on the particular role you have applied for. At Voxpro they can offer a promising career with lots of opportunities to progress within the company. They believe in supporting talent and encouraging employees to grow and succeed . Furthermore, they believe each person is unique and each contribution matters. Voxpro staff own their journey and are empowered to realise it. They believe in careers without ceilings. Their culture is unique and cherished by all employees. Their diverse multilingual teams, vibrant office environment and opportunities to learn and progress are inspiring! This is a unique opportunity to join the team and be part of really making a difference at Voxpro. Their clients are amazing and world leading in delivering beautiful customer experiences. Voxpro are currently recruiting for a number of a English speaking roles across variety of contracts. Start dates are depending on the contracts and the roles. Please come and meet their team who are looking forward to meeting YOU!